It’s almost that time of the year again when hundreds of thousands of bottles of French Beaujolais Nouveau wine are flown to the Far East and the USA for the traditional 15. November sale in restaurants. This year, Lufthansa Cargo along with their joint venture partner ANA Cargo will transport around a hundred thousand bottles of this year’s new wine to Japan. The transport started already on October 26th when both ANA and Lufthansa moved the first shipments into Tokyo. Lufthansa operating with freighters and using the bellies of their flights to Tokyo and Osaka, first trucks the Beaujolais Nouveau from France to their FRA hub. ANA uses direct passenger flights from Paris as well as from Brussels and London. In a cultural exchange agreement between China’s Henan Museum and the National Museum of History and Art in Luxembourg, it was agreed that various highly valuable historical Chinese artifacts should go on show in the Luxembourg museum. Cargolux was chosen to transport these 145 pieces of irreplaceable art which in total weighed around 3 tons. 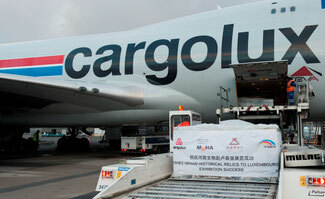 They were carried on a CV B747 freighter from their Chinese hub in Zhengzhou to their home base in LUX. The collection will be displayed at the National History and Art Museum as part of an overall exhibition entitled “The Origins of Chinese Civilization - Archeological Treasures from Henan.” The exhibition which is due to open soon will highlight 3,000 years of Chinese heritage dating back to the Xia and Shang Dynasties. An agreement has been signed between Dallas/Fort Worth Airport and France’s Groupe ADP - Paris Charles De Gaulle (CDG) Airport which is aimed at developing joint air cargo strategies between Dallas and Paris. The idea is to strengthen the trans-Atlantic cargo flows by concentrating on various key industries such as pharmaceuticals, hi-value products, luxury goods and perishables as well as generally promoting air cargo movements between both cities. The agreement follows on a recent visit of a DFW trade mission to France and it is estimated that there already exists an annual trade flow between France and Texas valued at around US$6 billion. Dallas/Fort Worth Airport has also invested a considerable sum in a new cold chain and temperature sensitive handling facility at the airport. Aviation fuel costs are rising considerably at the moment and giving carriers around the world headaches as far as trying to keep costs as low as possible. The Turkmenistan government has come up with an idea to entice airlines to use the country’s airports. They have recently announced that they will grant reduced fuel prices to all carriers who would use Ashgabat, Turkmenabat, Mary, and Dashogus as well as Turkmenbashi airports as technical stops on their operations between Asia and Europe. It is said that Cargolux is the first carrier to enjoy the discounted fuel price. They make technical stops in Turkmenbashi 20 times per week. Other carriers such as Lufthansa Cargo, USL Airlines Cargo (operating for Turkish Cargo) and Chinese carrier Uni-Top also use Turkmenistan as tech-stops. UK-based CargoLogicAir has successfully completed two B747 freighter flights from Atlanta to London Stansted and from Chicago to Shannon, Ireland, carrying various very valuable elite racehorses. The flights followed on CargoLogicAir having been awarded a license by the United States Department of Agriculture (USDA). The flight to London carried two highly valuable so called ‘warmblood mares’ which will take part in this year’s famous Tattersalls Newmarket Sale. The flight to Shannon carried a total of 80 racehorses, each weighing 500 kilos. Specially trained grooms accompanied the sensitive animals on their journeys from the USA to Europe. UK-based Hermes Logistics Technologies (HLT) has supplied India’s Hyderabad International Airport with a new state-of-the-art Cargo Management System (CMS) to enable the airport to achieve a smoother cargo handling in the future. Hermes has signed a five-year deal with the GMR Group subsidiary GMR Hyderabad International Airport for the system which includes an upgrade schedule to make sure that the airport continues to receive regular CMS updates. Hermes states that only a total of 60 days after the agreement was signed was needed by them to supply the airport with the new system. The Istanbul-based Turkish Cargo has been operating into Vietnam since 2015 with a twice weekly Airbus A330-200 freighter between Istanbul and the Vietnamese capital of Hanoi. The carrier recently announced that they will also commence freighter flights from Europe to Vietnam’s southern gateway in Ho Chi Minh City. This new service will be operated by TK Cargo Boeing 777F equipment. The B777F can carry up to 110 tons per flight which is considerably more than the A330F payload. TK Cargo already operates three B777Fs and has a further two on order. There is an increased demand for capacity from Ho Chi Minh to Europe as the export of the country’s chemical and electrical goods continues to rise. The independent freight forwarding network, WACO which boasts many members around the world, has increased their presence in Australasia by adding two new members for Australia and New Zealand. In Australia, International Trade Management (ITM) has taken up membership in the WACO System. ITM are headquartered in Melbourne. In New Zealand, Auckland-based Pengellys, which is still a family owned business has also become a WACO member. Both companies were welcomed into the WACO network at this year’s General Meeting which was held in Manila. The WACO system now has 120 independent forwarders in 116 countries as members.